From scrumptious food to magnificent temples, there are plenty of things and places to explore in Thailand. But what if you are looking to save your money while travelling? Fret not, because here are 10 Free Things To Do in Thailand! What’s so special about this market anyway? Well, it turns out that Chatuchak Weekend Market at Kamphaeng Phet 3 Rd happens to be one of the largest outdoor markets in the world. And they are not kidding about that: the market itself spans over 25 acres with more than 5,000 different stalls. You can find lots of items sold in the market ranging from the likes of clothing & accessories to food & beverages to even furniture and pets. If you plan to visit the market, it is advisable to arrive as early as possible (it opens at 6 am, even though most stalls would only start trading their businesses around 8 am or 9 am). Here is another market that you can’t afford to miss. Pak Klong Talad is a popular 24-hour market located on Chakkraphet Rd that sells various kinds of flowers. Roses, orchids, chrysanthemums, lilies… you name it, it’s like walking to heaven filled with an abundance of colours. You will also find assorted fruits and vegetables around this market as well. Feeling a little too overwhelmed visiting the crowded streets of Bangkok? Here’s a brief respite for you: the 142-acre Lumpini Park, an inner-city park located at Rama IV Road where you can relax or do some stretching. It basically has everything a park should have: a row of trees, benches, a lake, manicured lawns, running tracks and so on. You can even join an outdoor aerobic class for free in the evening. Shrines are a dime a dozen in Bangkok alone. 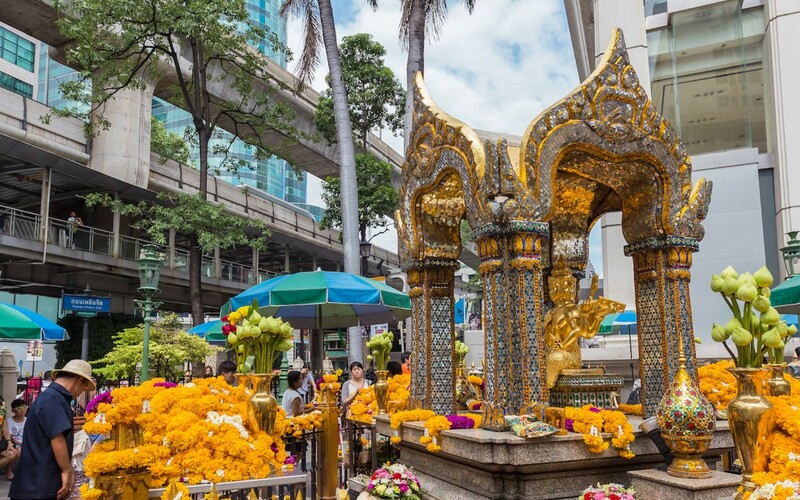 But if there is one shrine you need to pick to visit, then it would be the Erawan Shrine. This historical shrine, which was originally built way back in the 50s, was particularly popular among the locals and foreigners, where people come and burn incense and make offerings. There are live performances here as well, which is accompanied with music and traditional Thai dancers. 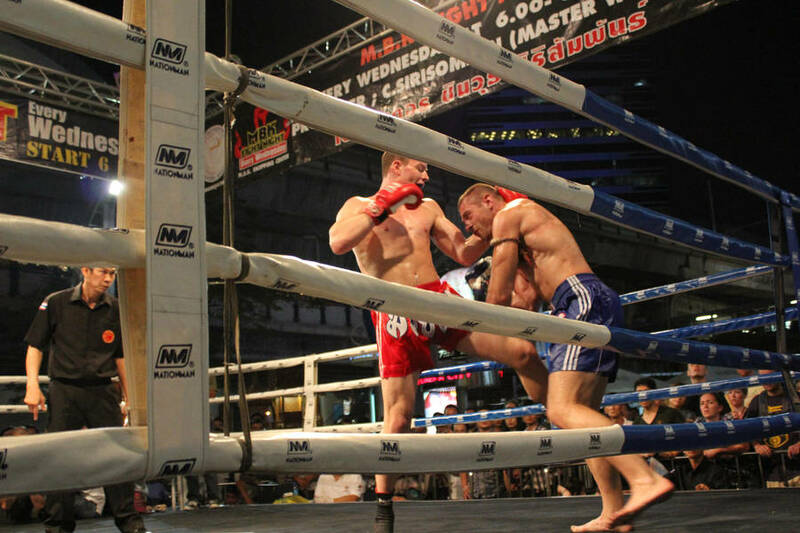 No visit to Thailand would be complete without witnessing a live Muay Thai fight. The thing is, you need to pay a ticket to watch them fight in the ring, which can cost a minimum 500 baht or RM64 apiece. But thankfully, there’s an alternative where you can see them in action for… free in MBK Center at 444 Phayathai Rd. The aforementioned free fight takes place every Wednesday from 6 pm to 9 pm. Otherwise known as Temple of Dawn, Wat Arun is one of the must-visit iconic temples in Thailand. Visitors can climb the designated stairs to the top, where they get to immerse in the panoramic view on the surrounding that overlooks the Chao Phraya River. And yes, you need to pay a fee to enter the temple. 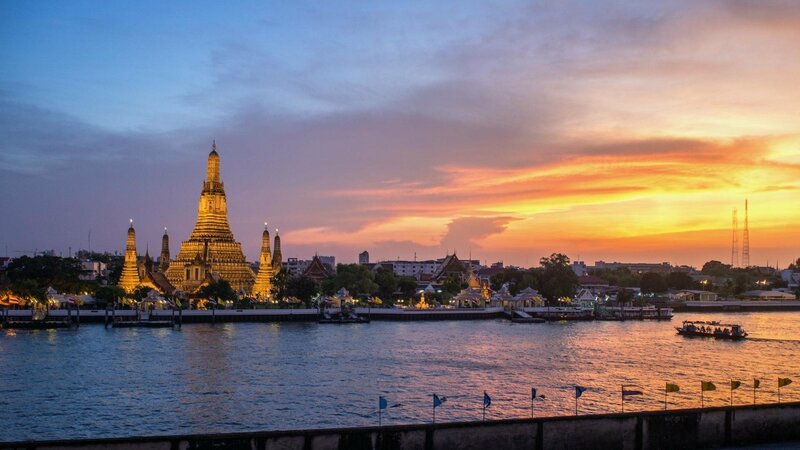 But did you know you can enjoy the majestic sight of Wat Arun for free, particularly when the sun goes down? Make sure you go across the river and try to find the right spot (e.g. the small pier near the Supanniga Eating Room) to take a few photos on the lit-up Wat Arun during the sunset. Bangkok is no stranger when comes to shopping malls. And here’s one for you can’t afford to miss: Siam Paragon, which is strategically located near the Siam BTS Skytrain station. This hugely-popular shopping mall houses over 250 shops selling everything from luxury designer brands and high-street fashion to IT products and F&B outlets. Can’t get enough of window shopping? Continue your journey to MBK Center, which can be easily accessed via a skywalk. Not to mention these malls are also an ideal visit for taking an air-conditioned break from the scorching heat in the city. There are plenty of free museums that you can visit in Bangkok alone. One of them is the Bangkokian Museum situated near the bustling Charoen Krung Road. This particular museum exhibits how a typical middle-class home looked like in Thailand back in the mid-20th century. It has all the old-school charm in every nook and cranny that transports you back in time. The museum opens every Wednesday to Sunday from 10 am till 4 pm. 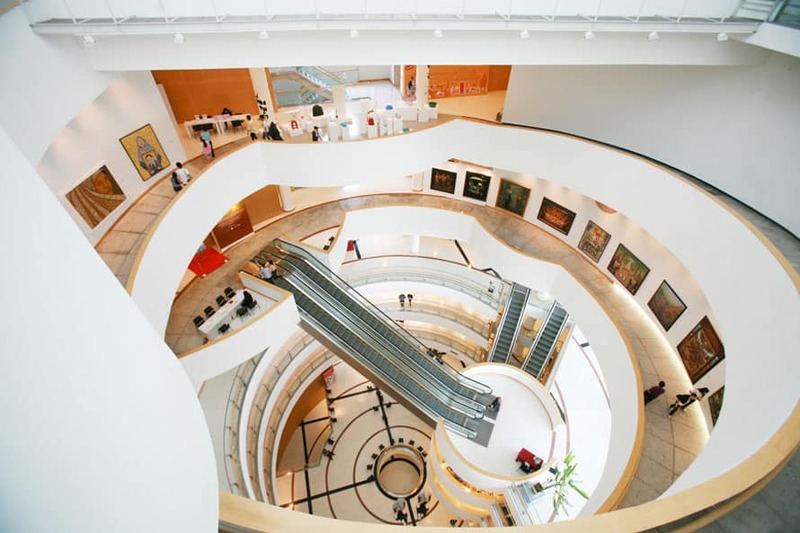 If you are an art lover, then you should visit the Bangkok Arts and Culture Center (BACC) near the MBK Center. It houses plenty of galleries and exhibitions displayed within the building. The art centre opens every Tuesday to Sunday from 10 am till 9 pm. This 2.4-acre dome filled with lush greenery houses hundreds of butterflies and other insect species. Don’t forget to bring along a camera, where you can take some photos of these beautiful tiny insects. Other than photo opportunities, you can also visit the likes of exhibition area and Lamphu tree ground. 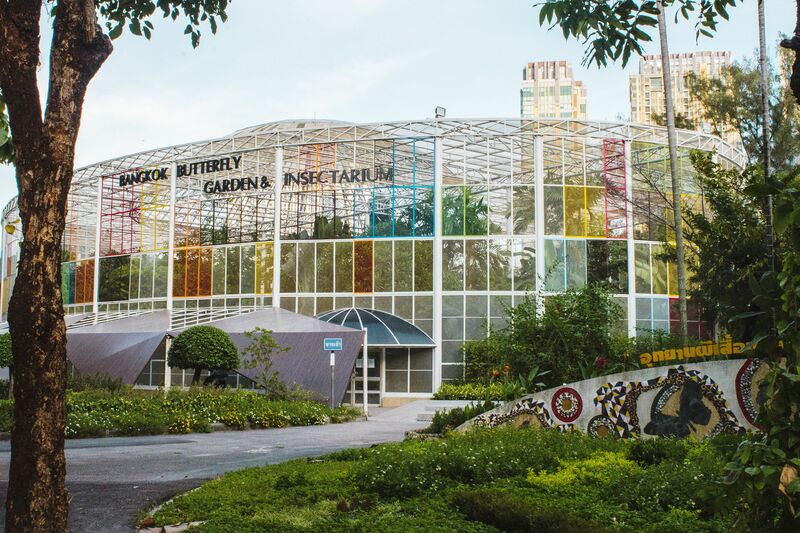 The Bangkok Butterfly Garden and Insectarium opens from 8.30 am till 4.30 pm every day except on Mondays.